Mark June 25 on your calendars: there will be team/individual pictures at 4:30pm (before practice) and Float n’ Flick will be held that evening 8-10pm. If you want to order photos, please bring a completed order form with you to picture day along with payment. 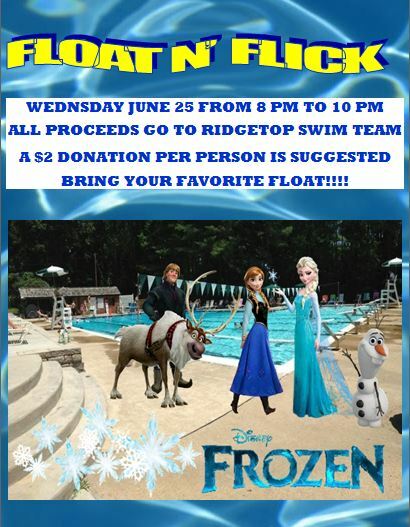 The featured movie is “Frozen.” A $2 donation is suggested; all proceeds will go directly to the Ridgetop Swim Team! Meet #5 Recap: CCV at Ridgetop – Senior Night! Meet #5 Info: CCV @ Ridgetop – Senior Night!